SingleCare is a free prescription discount card. Think of us as your ticket to better savings. SingleCare is free to use, and there are no hidden fees or obligations. We believe that you should be able to get the best price possible for your prescription medication, and we help you get it. It's that simple. Since 2014 we've helped millions of Americans save millions on their prescriptions. Get in on the savings by downloading our card today. This is a medical discount plan. This is NOT insurance. This program offers you the opportunity to locate providers of various types of medical services who will offer their services to you at discounted rates. The range of discounts for medical or ancillary services provided under the plan will vary depending on the type of provider and service received. You are fully responsible for paying for all health care services but will be entitled to receive a discount from those health care providers in accordance with the specific pre-negotiated discounted fee schedule. This program does not guarantee the quality of the services or procedures offered by the providers. 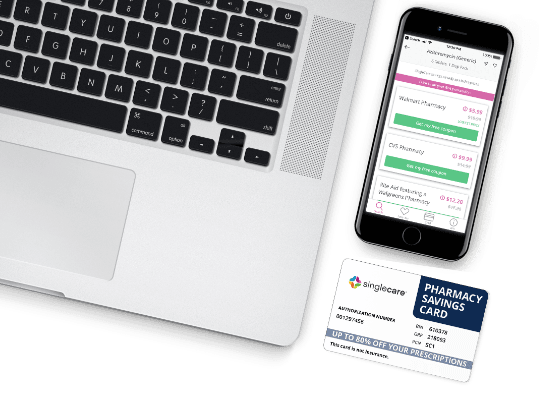 Except for prescription drugs which you will pay directly to the pharmacy at the time of purchase, all other services received through a program provider will be charged to the credit card on file in your member account. The charge will include an administrative fee for use of the program. Towers Administrators LLC is the licensed discount medical plan organization with its administrative office located at 4510 Cox Road, Suite 111, Glen Allen, VA 23060. SingleCare Services, LLC is the marketer of the discount medical plan organization including its website, singlecare.com, with its corporate office located at 99 High Street, Suite 2800, Boston, MA 02110. For additional information, including an up-to-date list of providers, or assistance with any issue related to program membership, please contact member support any time at www.singlecare.com, or by calling toll-free 844-234-3057, Monday through Friday 9am-9pm EST.